“My Mother just received a notice to appear before the Financial Crimes Investigation Division (FCID). My Mother has always stayed away from politics. Does she deserve this harassment?! ‘Yahapalanaya’ seems just a facade for this government. Vengeance isn’t ‘good governance.’ Targeting my Mother proves it. President Rajapaksa and I, as politicians, are always ready to face political vengeance. 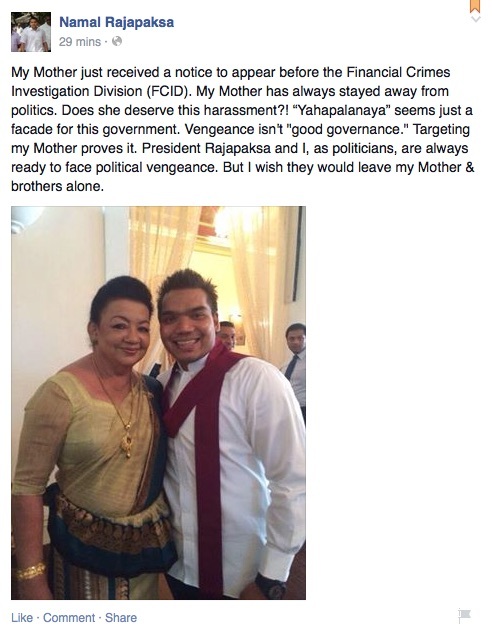 But I wish they would leave my Mother & brothers alone” says Namal Rajapaksa.